You usually call a professional locksmith service provider when something is wrong. 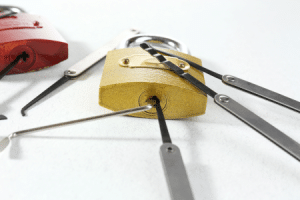 To the laymen, a professional locksmith can sometimes seem nothing less than a magician that instead of a magic hat and a mysterious wand wields no less mysterious professional locksmith tools. These tools are essential to any locksmith that wishes to actually deliver solutions. Broken key extractor: this is an extremely common problem. Keys get weak due to wear and tear, poor care, and the like. When they get weak and used with force they can easily snap inside a lock. This, in turn, creates quite a problem. The professional locksmith will use a broken key extractor to easily pluck the remaining key pieces from within the lock. Tools designed to apply tension: almost any lock picking task has to do with applying various degrees of tension to pins within the lock. The professional locksmith has several tools designed to apply varying degrees of tension on pins, which include a torque wrench, a tension wrench, and a feather wrench for example. The more sophisticated tension applying tools can hold picked pins in place until all of the remaining pins have been picked and then turn the plug thus unlocking the lock. These tension applying tools are good not only for house door locks, but also for commercial locks, car locks, and the like. Since they serve many purposes they come in all shapes and sizes but share their main operating principle. Rake pick: sometimes luck is a lady. This crude pick can easily pick some locks while remaining utterly useless with others. All you have to do is insert it into the lock and wiggle it around, trying to pick pins as you go. It doesn’t sound the most professional thing to do, but sometimes it proves to be a quick and effective solution. Half-diamond pick: this is a precision tool. This means it is usually used to pick a single pin without disturbing the other pins next to it. This tool is great when you have to give your undivided attention to a specific pin. Short or long hook: this is a sensitive tool that enables locksmiths to feel around the inside of a lock. Since locks come in different shapes and sizes so does the short/long hook come in many lengths Using it, a professional locksmith can learn the amount of pressure that needs to be applied, learn the precise configuration of the tumbler, and eventually, pick the lock and open it. It goes without saying that there are many other tools out there. Some are basic while others are sophisticated and rely on advanced technology. However, most tools share the same principles as described above.